Whenever you want a quiet space or an auditory feast, the MonoDeal active noise cancelling headsets are your best choice. With lightweight design, adjustable headband and soft earmuffs, it is comfortable to wear all day long for travel, work and anywhere in between without fatigue or oppression. The high-precision noise reduction circuit effectively reduces 85% of the background noise, helping you focus on what you want to hear - whether it's your music, your calls or simply peace and quiet. It works in two modes, noise reduction state or common headset state. When battery runs out, it still works on common state. The Built-in 3.7V 120mAh lithium battery supports up to 20 hours playing time. Easy to recharge it with the included micro USB cable. GREAT NOISE REDUCTION: Built-in ANC inverter noise reduction circuit, reduces 85% of background noise. Ideal for use when traveling by airplane, working in a noisy environment (such as an office or loud coffee shop), or simply when encountering noisy environments in daily life. Makes quiet sound quieter and music sound better. EXCELLENT HIFI SOUND - Stereo Wired Headset with premium 40mm diameter driver units ensure a high quality auditory experience featuring rich bass, as well as powerful and balanced sound. PORTABLE CONVENIENCE: Foldable Headphone in combination with the included airplane adapter provides a highly portable listening solution. Real aviation noise cancelling headphones. Perfect companion in cabin entertainment. LONG BATTERY LIFE: 3.7V 120mAh lithium rechargeable battery supports up to 20 hrs playing time. Repeatedly charged it without replacing batteries. TWO WORKING MODES - Never worry about being out of power! - the headphones will work as a regular wired headphone without battery (with noise cancelling turned off). 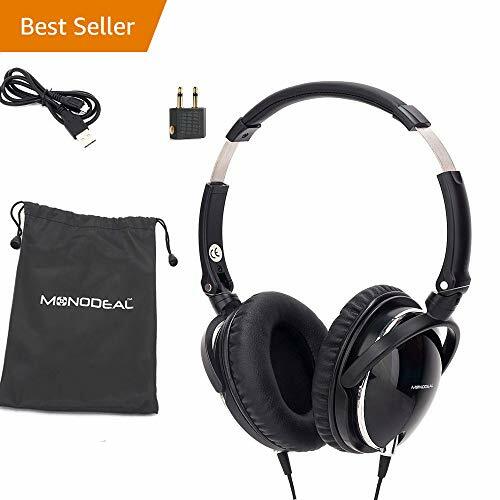 SUPER COMFORT: Comfortable over ear headphones with premium memory foaming ear pads, it has noise cancellation even turning off the active noise cancellations. Ultra-soft ear pads deliver a comfortable, fatigue-free listening experience even for extended periods of time. Headphones with Mic let your hands free.